When looking at this pond it gives me a very calming feeling. 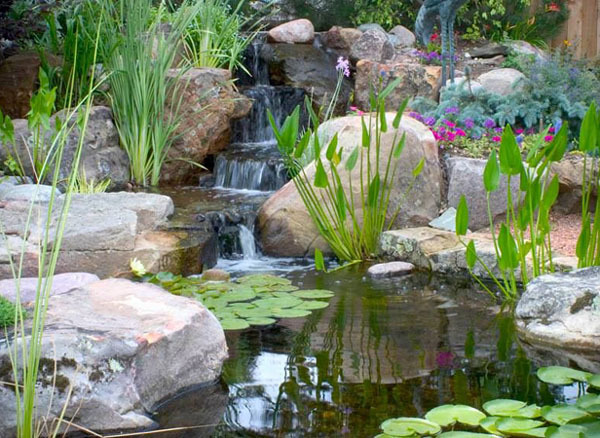 A good pond contractor must take great care in balancing between the elevation of the pond, the dimensions of the rock and the accumulation of plants. The building of fish ponds begins with setting out the elevations of the waterfalls. Then choosing the shape and size. Once that is chosen the dirt is then covered with a underlayment to prevent roots from penetrating the liner and then covering the underlayment with a good pond liner. A good qualified pond building contractor will always use a underlayment before the pond liner. A water garden looks more natural when a variety of rock are used. Some of the rock in this fish pond are granite and some are limestone. It is always good to choose the type of rock that will go well with the area that the pond is being built in. The pond also has nice grades to the waterfalls. This type of pond gives a nice calming sound and not so much of a rushing sound. Another nice feature of this pond is the stream curves around before spilling into the pond. This makes more of a natural look to the design of the pond and is much more appealing to the eye from afar and up close. The plants chosen for this water garden work well in many ways. The taller plants give elevation to the pond and are contained in the locations that they have been placed in and the lilies give coverage to the ponds water surface which also help in coverage for the koi, goldfish or other creatures living in the pond. Having numerous aquatic plants in the pond provide much more than just beauty, they also help in filtration which aids in water clarity. More often than not, a pond like this usually has some sort of filter pads that need cleaning on a weekly basis, but my recommendation would be a exterior filtration system that would take less hands on maintenance and also would possibly have a Uv filtration system that helps in keeping the water clear.